Shirehampton Public Hall is over 110 years old. As a listed building we need to make sure we protect its character. But we also need to make sure it is providing the facilities that people need today and in the future. Go to the bottom of this page to find out how you can help. In 2016 we commissioned a report to consider extending our lease of the building (itâ€™s owned by the City Council) to include the space occupied by the library. As well as concluding that we should take on the space, the report highlighted a number of changes that could be made to other parts of the building. We carried out consultation in early 2017 which supported the broad principles of modernisation and gave ideas for specific changes. In October we received funding from the Architectural Heritage Fund to employ an architect to prepare options. And in December we made an application to the Port Fund for Phase 1 of the modernisation. The library is the best used community facility in the area. In the recent Community Plan survey, 59% of people said they had used the Library in the last 6 months and 74% of people said theyâ€™ll miss it if it closes. Nevertheless, in November the City Council said it was going to close the Library next July. A final decision by the Council on the closure has been delayed until April 2018. But we still need to plan for the future. If the library rooms are vacated, what should we use them for? Could we provide a community run library to compensate for the loss of the Council run library? Can we make better use of the library room even if the library continues? This concentrates on the current library and its associated room. It assumes that the City Council will decide to close the library by July. An outline plan of the proposals is shown below. The current staff room will be converted to a meeting room and community library. 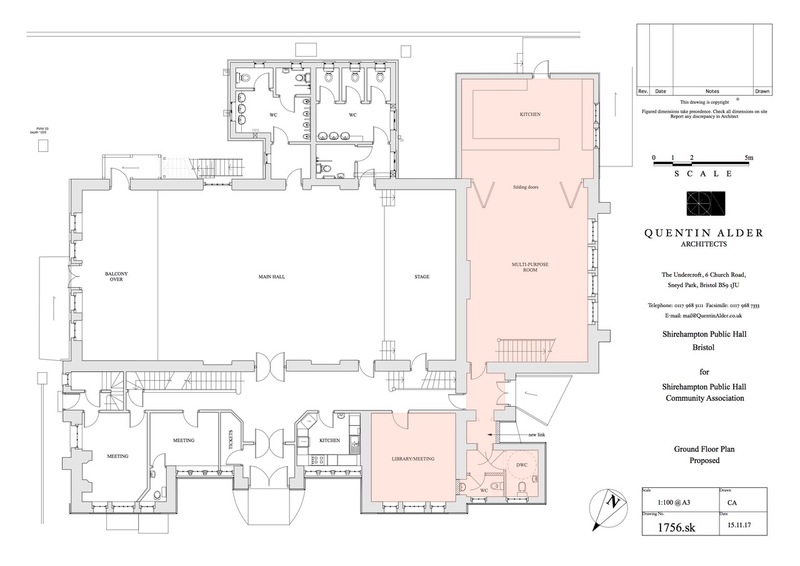 The current staff toilet will be reconfigured to provide a disabled toilet and unisex toilet accessed from the side door (current library entrance) lobby. The front of the building will be cleaned up, the clock repaired and landscaping carried out. In addition there will be a rebranding of the Hall and wifi in the building will be upgraded. The total cost of these works will be about Â£104,000. We have applied to the Port Fund for Â£51,500. The Association will invest Â£17,700 from its own reserves. We will be seeking Â£35,000 from other grant funds, donations, fundraising events etc. If we are successful works will start in late 2018. If the Council decides to keep the library open we will need to rethink some aspects of our plans, but we hope that the room will still be made into a multi-use space. 1. Vote for Us! The Port Fund includes a public voting stage between Saturday 6th and Sunday 14th January. Voting will be online and with paper surveys available at the Library. Please vote for us and ask your family and friends to do the same. Â· Events. If you fancy organising some fundraising events weâ€™d love to hear from you. Music, theatre, disco, race nights, raffles, auctions of promises â€“ anything that will help raise funds for the Hall Modernisation. Â· Publicity. We need to spread the word about the Hall and its modernisation. If youâ€™re good at writing, speaking or just getting the word around either face-to-face or via social media, let us know!